You have heard Roberta Solomon's voice. A versatile voice actor who’s worked in nearly every area of the industry, Roberta is heard daily on network promos, documentaries, topical news promos, national commercials, and as the image voice of scores of radio and TV stations. She is one of only a handful of women to voice movie trailers. Roberta works daily from state of the art studios in her home, and in recording studios on location. She also carries a portable studio with her when she travels, and has voiced projects from hotels, airports, closets, and once from a car in a cemetery. A longtime cast member of Sirius/XM's radio comedy show, "Right Between the Ears," Roberta started her career doing morning radio in Kansas City. While still in college, she donned a corset and made the leap to TV as a horror host, warping a generation of children in the process. Her creepy alter ego, Crematia Mortem, continues to receive fan mail. Crematia was recently inducted into the Horror Host Hall of Fame by Horrorhound Magazine and Ripley's Believe It Or Not, along with Elvira, Joe Bob Briggs, and the Universal "Shock" Movie Package. 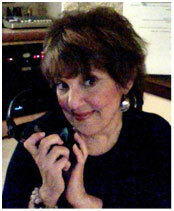 Voicegal Inc., Roberta's company, was founded in 1997.